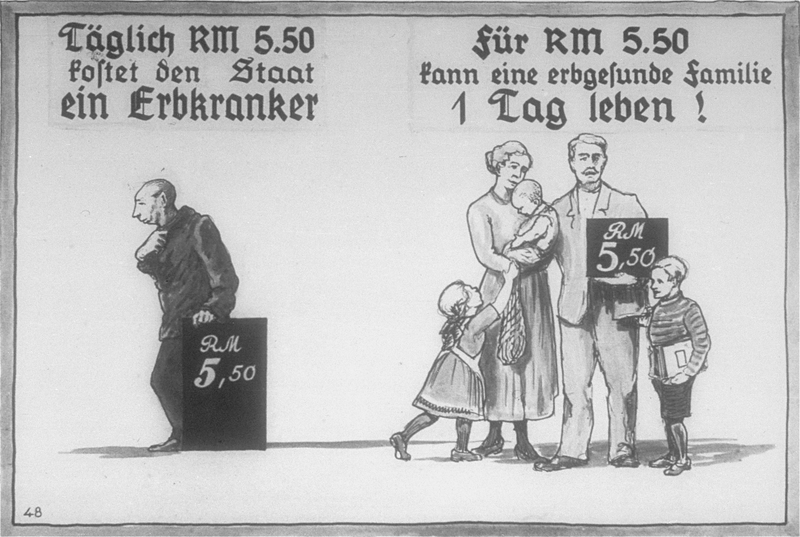 Soon after Hitler took power, the Nazis fulfilled long-held aspirations of eugenics proponents. Eugenicists believed the human race could be improved by controlled breeding. In an effort to further the Nazi vision of a biologically "pure" population and to create an "Aryan master race," on July 14, 1933, the German government promulgated the “Law for the Prevention of Progeny with Hereditary Diseases” (Gesetz zur Verhütung erbkranken Nachwuchses). This law mandated the forced sterilization of certain individuals with physical and mental disabilities or mental illness. Individuals who were subject to the law were those men and women who “suffered” from any of nine conditions: hereditary feeblemindedness, schizophrenia, manic-depressive (or bi-polar) disorder, hereditary epilepsy, Huntington’s chorea (a fatal form of dementia), genetic blindness, deafness, severe hereditary physical deformity, and chronic alcoholism. The law also allowed public health officials to apply the law to those, like Roma (Gypsies) and “asocial elements” who were seen to reject German social values. Prior to the 1930s, the United States had led the world in forced sterilizations. Between 1907 and 1939, more than 30,000 people in twenty-nine states were sterilized, many of them unknowingly or against their will, while they were incarcerated in prisons or institutions for the mentally ill. However, no nation carried sterilization as far as Hitler's Germany. German forced sterilizations began in January 1934, and altogether an estimated 400,000 people were sterilized under the law. July 26-30, 1933 News articles about new German "Law for the Prevention of Progeny with Hereditary Diseases"
July 27, 1933 - August 31, 1933 Editorials, opinion pieces, letters-to-the-editor, and political cartoons regarding the "Law for the Prevention of Progeny with Hereditary Diseases"
July 1-15, 1933 News articles, editorials, opinion pieces, letters-to-the-editor, and political cartoons regarding Hitler's order to draft a sterilization law and fears that Jews might be included in the groups to be forcibly sterilized. January 1-31, 1934 News articles, editorials, opinion pieces, letters-to-the-editor, and political cartoons regarding the beginning of forced sterilizations in Germany under the new law. Burleigh, Michael, and Wolfang Wippermann. The Racial State: Germany, 1933-1945. Cambridge: Cambridge University Press, 1991. Caplan, Arthur L., editor. When Medicine Went Mad: Bioethics and the Holocaust. Totowa, NJ: Humana Press, 1992.